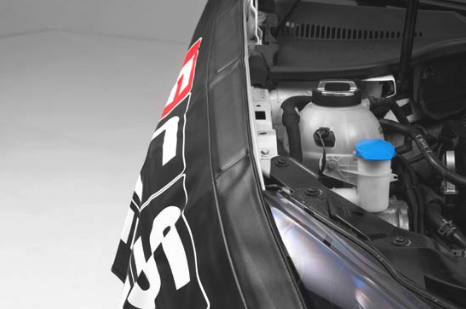 NOTE: Use a fender cover to reduce the risk of scratching or denting your vehicle’s body during the entirety of the oil service. 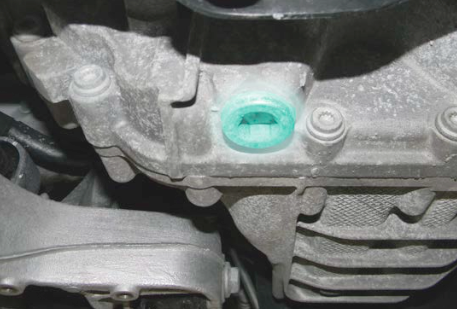 Begin by disconnecting the mass air flow sensor. 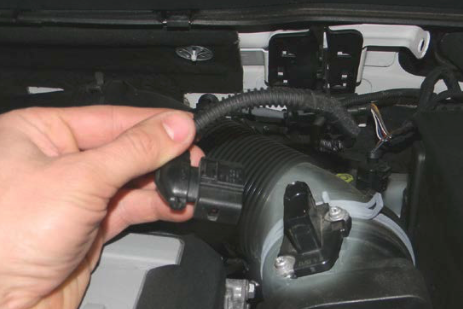 Disconnect the secondary air line from the front of the airbox. 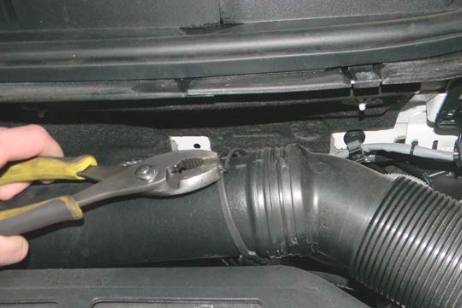 Remove the air box and all piping using a 5mm hex. An extension may be required. Remove the clamp connecting the intake elbow. 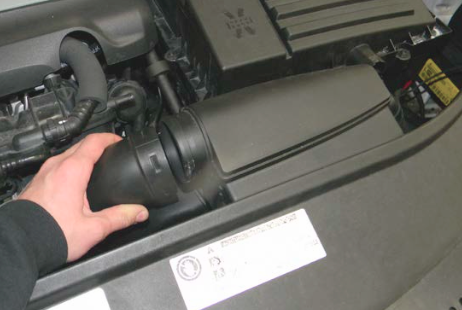 Disconnect the airbox from the front intake assembly. Removing the airbox from the engine bay will require some finesse. 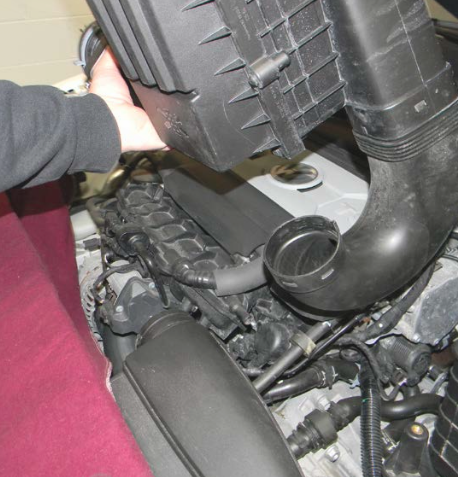 Rotate the airbox counter-clockwise while pulling it up and out of the way. 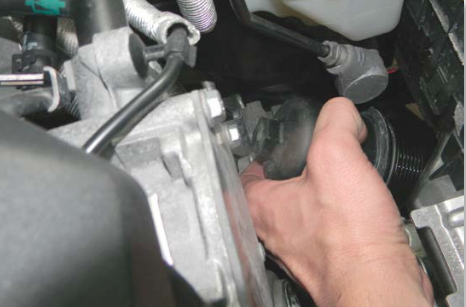 Using a 24mm socket on an extension, remove the transmission filter cap. Rotate the cap upwards out towards the passenger side of the car. Pull out the filter element. 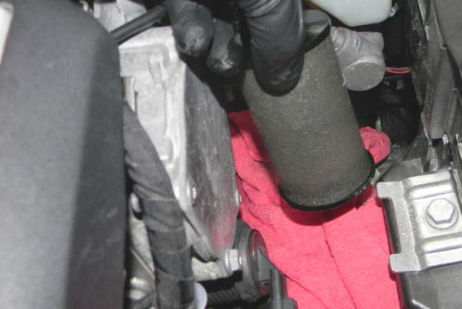 Place a rag on the opening to prevent debris from falling in and to collect excess oil. Remove the filter cap o-ring and replace it using the provided new o-ring. Lightly oil the new o-ring. 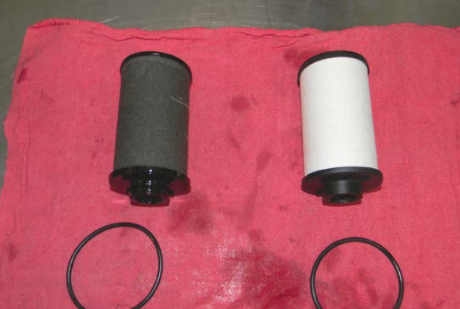 Install the new filter element, then install the oil filter cap and torque it to 20Nm. Thread it on by hand to avoid damaging the plastic threads. 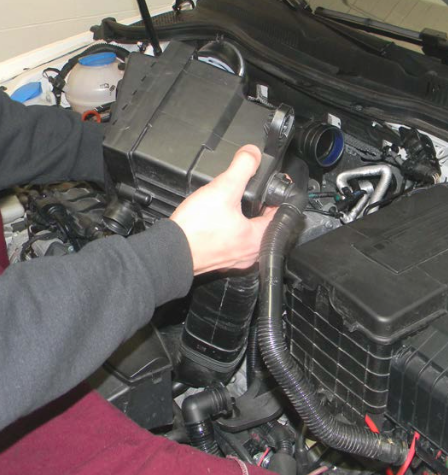 Re-install the airbox and hoses, then plug in the mass-air ow sensor. 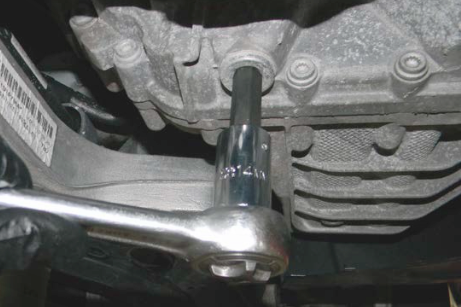 Safely raise and support the vehicle so you can access the drain plug. 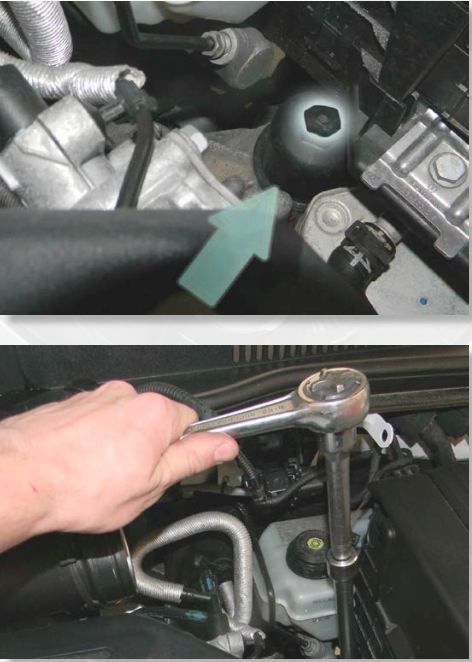 Place a catch pan directly underneath, then using a 14mm hex socket, remove the drain plug. 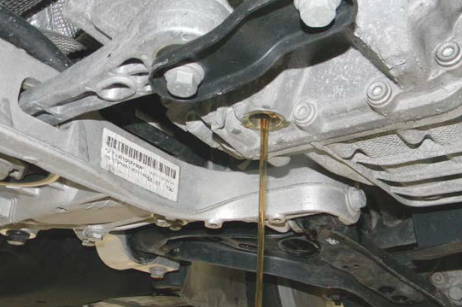 A large amount of oil will drain from the transmission. 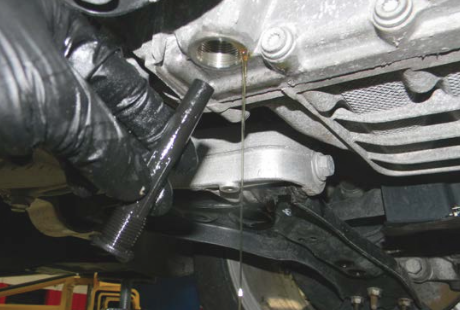 Allow the oil to fully drain into the oil catch pan. Notice the black 8mm overflow snorkel. This part acts as an overfill drain. 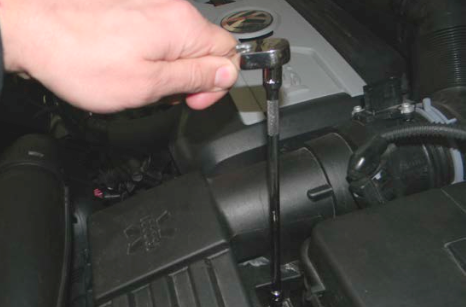 Remove the snorkel by unthreading it, allowing all of the oil to completely drain. 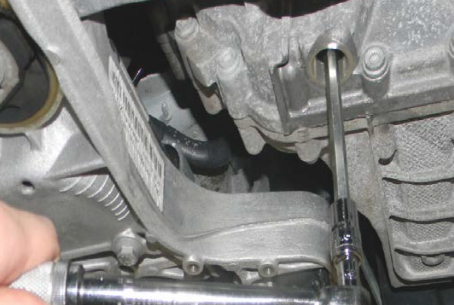 Re-install the snorkel after all of the old oil has completely drained and torque it to 3Nm. Thread the silver DSG filling adapter into the drain hole. 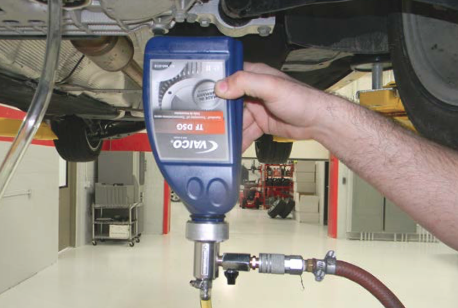 The filler tool utilizes a maximum PSI of 20; 10 PSI is highly recommended as a limit to avoid over pressurization of the transmission fluid bottle. 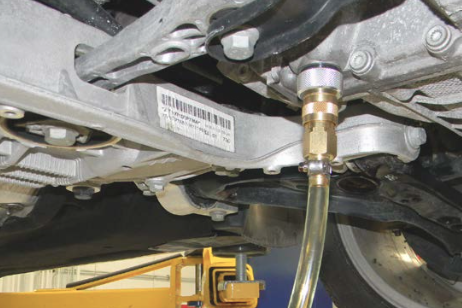 An over-pressurized transmission fluid bottle can reach a limit where the explosion is imminent. For this reason, it is strongly recommended to take extra safety precautions such as wearing protective eyewear and gloves when using this procedure. 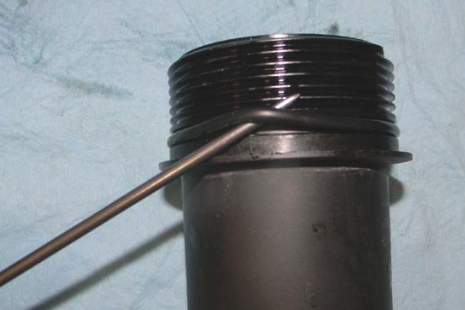 Install the pressure tool onto the oil container. 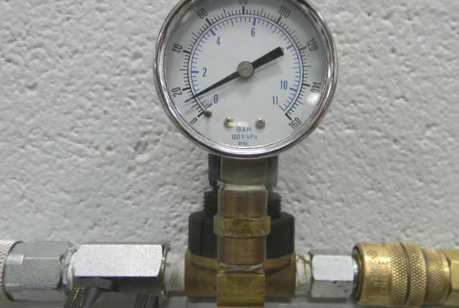 Set the air compressor regulator to 5-10psi. Hook the brass connector onto the adapter that is screwed into the bottom of the transmission. Hook up air pressure to the unit. 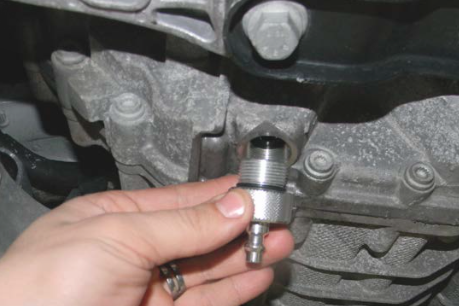 Make sure the valve on the tool is in the off position before connecting the air. Flip over the oil container and slowly open the valve. 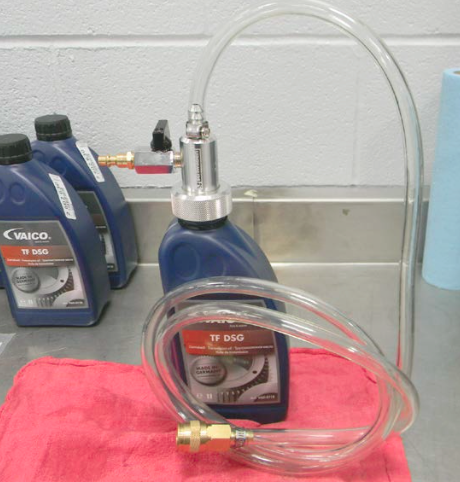 When the bottle is empty, close the filler tool valve, replace with a full bottle and continue filling with 5.5-6 liters. Warm up the car; 10-15 minutes of idling the engine from cold will be sufficient. Keeping your foot on the brake, cycle through each gear selection for 3-5 seconds. This draws the fluid into the transmission at each gear. specification; when not available, using an appropriate thermometer will be adequate. 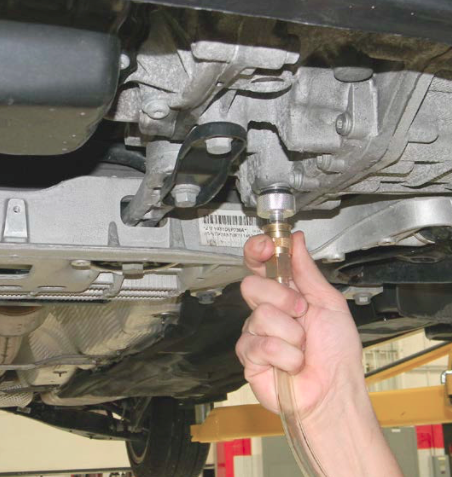 Remove the filler hose and let the excess oil drain out of the transmission. 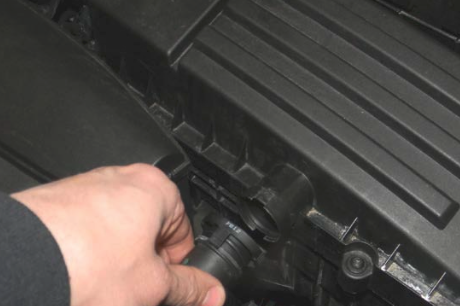 Remove the filling adapter and install the drain plug with the provided new seal. Torque the drain plug to 33 ft lb/45Nm. Your Direct-Shift Gearbox fluid is ready for another ~40,000 miles! Interested in purchasing? Click HERE to shop now!